Jo Jayson’s extraordinary thirteen paintings of Sacred Feminine archetypes, prophetesses and women of strength, herald the way to a unique path back towards self-love. In ‘Self-Love Through the Sacred Feminine’, Jo Jayson gives these thirteen Sacred Feminine energies and archetypes a voice, explaining through prayers, meditations, and healing lessons, how to reconnect back with our own soul, tap into our own innate wisdom and navigate our way through life challenges helping us understand that as women, we are the expressions and reflections of the Sacred Feminine, and that our souls are ‘cups full of Source’™. 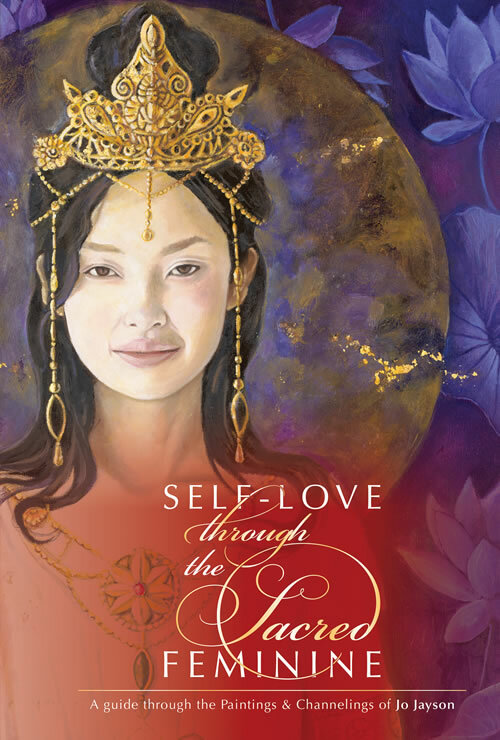 Learn to love yourself unconditionally, become empowered, access courage, forgive, embody the Sacred Feminine and weave the web of your life. Now is the time to identify and use your own magical wisdom and the intentions of your heart, guided by the Sacred Feminine within you . Paintings and channeled wisdom of archetypes Guinevere, the Magdalene, Brighid of Ireland, Isis, Mary the Mother, Jeanne d’Arc, Miriam, Guan Yin, Morgan le Fey, Artemis, Kali Ma, Inanna, and Grandmother Spider.